Good product roadmap tools allow key stakeholders to gain a multidimensional view into the future – it also helps them work with their data to predict the outcomes of their strategic product plans. In addition, armed with these roadmap tools (or as I like to call them, crystal balls) allows companies, rather to rely on hunches or guesses, to better predict and project farther into the future with the confidence that the decisions they have made are based on concrete product data that is relevant and up to date. We at OneDesk, strongly recognize that roadmapping is about more than just moving a project forward; its about providing key product teams with customer-driven insight, that enables them to take proactive action, respond to changing marketplace dynamics and ultimately move their process forward in the right direction. 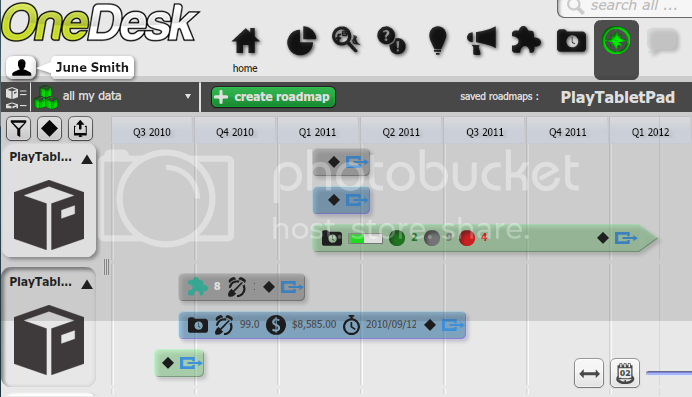 Our roadmap tools are intuitive, easy-to-use and most importantly they integrate with every other social business application across the OneDesk platform.